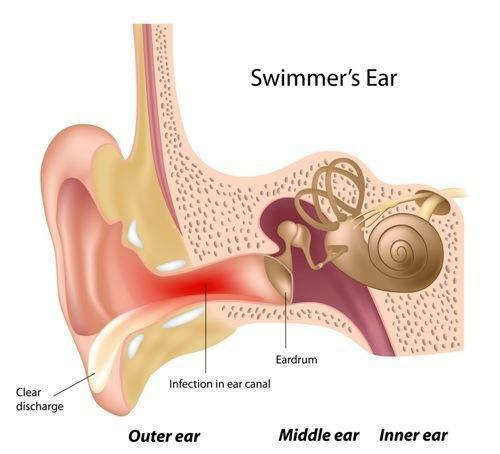 Surfer’s ear is a condition in which exposure to cold water or wind in the ear canal stimulates new bone growth in the canal, narrowing it over time. Mild cases generally require no treatment, but moderate to severe exostoses may cause frequent ear infection due to trapping of water and debris. Exostoses can be prevented by wearing water tight ear plugs during exposure to cold water and/or a wetsuit hood. Those who swim or surf in colder waters are more at risk than those in warmer climates. Custom ear plugs for swimmers are offered in our office, as well as off the shelf options. If you suspect you have exostoses, an evaluation by an ear, nose and throat doctor can help determine if you need treatment. Surgical treatment is performed as an outpatient under general anesthesia. The severity of the narrowing usually determines the approach used for surgery, but some can be removed through the ear canal, which allows for a shorter recovery time. "Dr. Pettis and his staff in his Irvine location were the most kind and easy going folks." "Very nice office and staff were very pleasant." "Simply outstanding. Caring, compassionate and thorough." Welcome to OC Ear, Nose, Throat, Head & Neck Surgery. We provide comprehensive medical and surgical ear, nose, and throat care for adults and children. Our in-office services include balloon sinuplasty to immediately relieve sinusitis, CT scans of the ears and sinuses, as well as allergy testing and immunotherapy. We also offer complete state-of-the-art hearing evaluations and hearing aid fittings. We perform surgeries at Hoag Hospital in Irvine and Newport Beach, Mission Hospital, CHOC Children’s Hospital, and Long Beach Memorial Hospital. We focus on individualized care and on developing trusting relationships with our patients. We never rush an appointment and we empower our patients with full understandings of each diagnosis. We look forward to meeting you! Please contact our office if you have any questions regarding your insurance plan. "Dr. Pettis goes above and beyond for all his patients. He has helped me tremendously. His entire staff is professional and so friendly." "He is intelligent, compassionate, easy to talk to and understand, and never makes you feel rushed during your appointment." "Dr. Pettis and his staff in his Irvine location were the most kind and easy going folks I have ever experienced." "Dr. Pettis was not only kind and thorough but knowledgeable and he conducted basic exams that somehow escaped previous analysis at multiple doctors offices." "Dr. Pettis takes his time with his patients. He is thorough and explains everything so you have a good understanding of the procedure. We are very pleased"
"Dr. Pettis literally saved my life with a very difficult surgery on a massive thyroid tumor that reached internally, inside my chest. "